G3YNH: Digital Readout & All-Mode Adapter for RAcal RA17, part 4. The basic principles of IF-offset frequency counting are explained in the author's digital frequency readout article. Frequency Counter: Circuit Diagram (72K GIF, 839 x 1153 pixels). The IF offset may be introduced either by pre-setting the count register (ie., when the CIO is fixed at 100KHz or not in use); or by counting up from pulses derived from the variable CIO, in which case any deviation of the CIO from 100KHz is automatically accounted for. A1, B1, and C2 are gated together to produce the signal denoted "Sample Select Clock". This signal is used to toggle the 7474 'sample select' flip-flop, so that the sampling gates for the CIO and VFO inputs can be activated alternately when the settings of S2 (demodulation mode) and S3 (CIO mode) permit. Also derived are a preset signal for the count register, and strobe signals for transferring the contents of the count register into the display and AFC registers at appropriate times. The signals denoted 'Read CIO' and 'Read VFO' are not derived explicitly, but are shown on the graph to indicate the positions of the data acquisition windows. Note that the count register preset signal has a potential glitch (marked with a *) which can occur due to propagation delays in the sample select flip-flop and subsequent gates. This is eliminated by inserting a 40ns (approx.) delay into the sample select clock before combining it with the flip-flop output. Fixed Offset Mode is used when the variable CIO is not in use. In this case the sample select flip-flop is jammed in VFO mode, and the count register is preset to 100_00 before down-counting commences. Counting occurs for 100ms, then the sample gate is closed for 25ms while the data is strobed into the display and the count register is preset ready for the next cycle. The overall data refresh rate is 8Hz. Variable Offset Mode is used when the Variable CIO is in use. In this case, the sample select flip flop is allowed to toggle, and the count register is preset to 000_00 (ie., reset) before the start of each cycle. At the end of the CIO up-counting period, the least significant digit of the CIO frequency is loaded into the AFC register (discussed shortly). At the end of the VFO down-counting period, the register has accumulated CIO freq. - VFO freq. (modulo 100000), which is the required 'Kilocycles' readout to 10Hz. The overall refresh rate is 4Hz. Read CIO Mode is engaged when S3 is placed in the read position and S2 is set to SSB or CW. In this case the sample select flip-flop is jammed in CIO mode, and the count register is preset to 000_00 before up-counting commences. After counting, the display and AFC registers are strobed simultaneously, and the display shows the CIO frequency to 10Hz. The overall refresh rate is 8Hz. The display in the original counter uses nixie tubes and 74141 decoder ICs, a choice which is perhaps not to eveyone's taste. These can be replaced by 7-segment LEDs and 74LS47 decoders if so desired. The chip count can also be reduced slightly, by replacing four of the 7475 display registers with 2 x 74xx373 octal D-type latches. There is no reason why most of the logic chips cannot be replaced with 74LS or 74HCT series parts, although the 74141 is only available as a standard TTL part. The possibility of using 74HCT (60MHz) CMOS is interesting, because the power consumption will then be considerably reduced, and each 74HCT output is capable of sinking 4mA. 74HCT chips can therefore be used to drive the 74141 decoders (-3.6mA source max) directly, if used. Note that for interfacing with TTL, 74HCT series CMOS must be used. The 'T' indicates CMOS using TTL logic levels, and must not be confused with standard 74HC series CMOS. View of the original counter in its screening trough. Note that the VFO amp., the 1MHz amp., the CIO TTL buffer, and the fixed 100KHz CIO output and BPF are all on this board. CIO AFC System: It is a perfectly straightforward matter to build a stable 100KHz VFO, and so frequency locking of the CIO is unnecessary. It was included however, so that the author could evaluate the idea of using counter register contents to control oscillators in other applications. A register storing only the least significant digit (LSD) of the CIO reading is connected to a 74141 BCD to decimal decoder, and the decoder output is used in such a way that; if the LSD is 0 - 4, the AFC voltage falls, pulling the CIO frequency down, and if the LSD is 5 - 9, the AFC voltage rises, pushing the frequency up. Thus, after an adjustment of the CIO, the frequency homes on to the nearest 100Hz step, ie., any frequency which causes the LSD of the measurement result to alternate between 0 and 9. The 'lock range' control is adjusted to prevent overshoot, so that a relatively short (~1sec) time-constant can be used. The circuit locks because, if the CIO tries to drift up, two zeros are produced in succession, and the average control voltage falls; and if the CIO tries to drift down, two nines are produced, driving the average control voltage up. When the circuit is adjusted correctly, the shift in frequency from the operator set position is never more than 50Hz. The lock LED circuit is arranged to extinguish the LED when the AFC register contains a 0 or a 9. Given the high saturation voltage of the 74141 output transistors, a 1N4148 diode is placed in series with the LED to ensure that it can be extinguished completely (the 74LS145 would be a better choice). The 'lock LED killer' circuit prevents the LED from illuminating when the counter is operating in fixed offset mode. The CIO AFC system can be omitted completely if so desired, eliminating the 7475 AFC register, the 74141 decoder, and two gates used to produce the AFC strobe signal. The AFC circuitry in the CIO can be omitted, up to and including the 100pF capacitor between the varicap diode and the tuning capacitor. 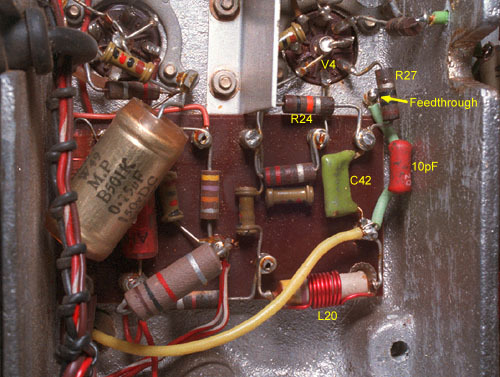 The obvious place from which to obtain a 40-70MHz VFO output is from the anode of V5. Fortunately, it is not necessary to dismantle the HF VFO unit because the anode load inductor L20 (wound on R18) is located in the central under-chassis compartment of V4 and V8. To evaluate this possibility, the wire from the 32MHz LPF and R26 were unsoldered from the PTFE feedthrough insulator 'Test Point 1' (next to V4 valveholder), and a 10pF capacitor was connected between the feedthrough and the anode end of L20//R18. An earthing tag was also added (above chassis) to one of the V4 valveholder retaining screws, so that a short length of co-ax. could be connected from the feedthrough to a small die-cast box containing a buffer amp. and a divide-by-100 prescaler. Obviously, the elimination of TP1 is not a good idea in the long term, and a permanent solution will be to add another feedthrough next to the original. Note however, that there is little room in which to do so, and care must be taken to ensure that there is no interference betwwen the feedthrough and the skirt of V4 screening can (removed for clarity in the picture above). The circuit above did not cause significant detuning of the HF VFO (which can, in any case, be corrected by adjusting C77 with the MHz dial set to '29'), nor did it degrade the receiver sensitivity. The problem experienced however, was that harmonics of the 405 - 695KHz prescaler output could always be heard in the receiver front-end. The interference was bad with a cable connected to the output, but still detectable with no cable attached; and was evidently due to a combination of radiation from the cable, and leakage into the harmonic mixer compartment and the heater line. The problem was not considered to be insurmountable at the time, but it pointed to considerably more experimentation than was originally envisaged; and in view of the fact that the RA17 already has a perfectly adequate mechanical MHz readout, the project was abandoned and the offending prescaler unit removed. With 19 years of hindsight, and in light of certain amount of technological progress, a solution to the problem described above is now obvious: feed the 40 - 70MHz VFO signal into a wideband video-amplifier IC (powered from the heater line as before) and use this to produce a straight VFO output capable of driving a 50Ω line. The line can then be properly terminated at the remote end, and heavily buffered before connection to any counting circuitry. In this way, all frequency components of the VFO output fall outside the receiver operating range, and any VHF pollution caused is likely to be minor in comparison to the HF VFO signal and its harmonics already radiated by the receiver (the HF VFO is disabled when external converters are used with the interpolation receiver). Once an HF VFO output has been provided, an offset-counting system to produce a MHz readout is easy to design; but the ergonomic requirements for a complete frequency readout are not the same as for the simpler 'KHz only' approach. If the display does not show MHz, then the procedure for operating the receiver is unchanged, and the counter merely dispenses with the inconvenience of using the calibrator and estimating frequency from the tuning scale. If the display does show MHz however, then the operator will come to rely on it completely; and it must therefore still read correctly even when the interpolation receiver is tuned past the ends of the selected 1MHz band. The solution to this problem is to extend the count register of the KHz section to catch overflow and underflow conditions, and use this information to add or subtract 1 from the MHz readout as appropriate. It may be useful to generate these signals even if a MHz readout is not to be implemented, since they may be used to light LEDs to warn the operator of the out-of-range condition. Note however, that unless the required gates are already spare, and are not too far away on the circuit board, one might as well attach the register to a 7442 BCD-to-decimal decoder and use outputs '6' and '8'. To make the setting of the 'Megacycles' dial uncritical, and to allow for drift, the filter used to select the 37.5MHz signal has a bandwidth of ± 150KHz, and the 40MHz bandpass filter has a bandwidth of ± 650KHz rather than ± 500KHz. Obtaining a 'MHz' readout is thus simply a matter of rounding the HF VFO frequency down to the nearest MHz and subtracting 40. In modular counting, this corresponds to presetting a count register to 60, so that the first 40 pulses cause the register to contain '00'. If the KHz counter flags an 'under range' condition, the MHz counter should be preset to 59, so that it takes 41 pulses to obtain '00', and the MHz display is thereby decremented by 1. Correspondingly, if an 'over range' condition is flagged, the MHz counter should be preset to 61, so that it takes 39 pulses to reach '00', and the display is incremented by 1. Although the offset HF VFO frequency only needs to be displayed to the nearest MHz, a method is required to remove the ±1 digit ambiguity which results from lack of a defined relationship between the input signal and the sample-gate signal. The author's preferred technique is 'synchronous prescaling' (described in the basic digital frequency readout article). An extension to the count register can also be used to provide a tuning bar-graph display, to assist the operator in setting the 'Megacycles' dial. The RA17 actually works, with reduced sensitivity, up to about 32MHz, but the unmarked positions on the dial are difficult to find in the absence of a tuning aid (an alternative might be to provide the RA17 with a 37.5MHz drive-level indicator, analogous to the system used in the Yaesu FRG-7). The considerations given above, and a choice of technology, define the basic architecture of the required counting system. 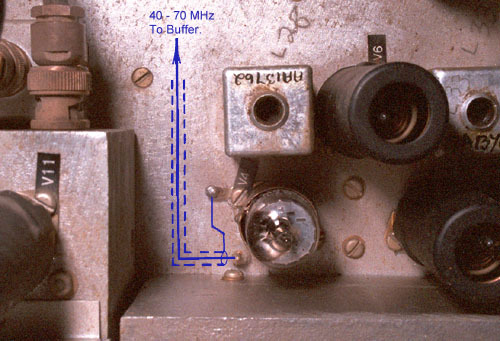 Note also, that the counter must now contain enough components to implement a conventional Digital Frequency Meter (DFM) at minimal extra cost; and so the unit might as well be provided with an 'external' counter input, which can, for example, be connected to a short whip antenna and used to check transmitter frequency. KHz counter overflow to MHz counter (no MHz offset).